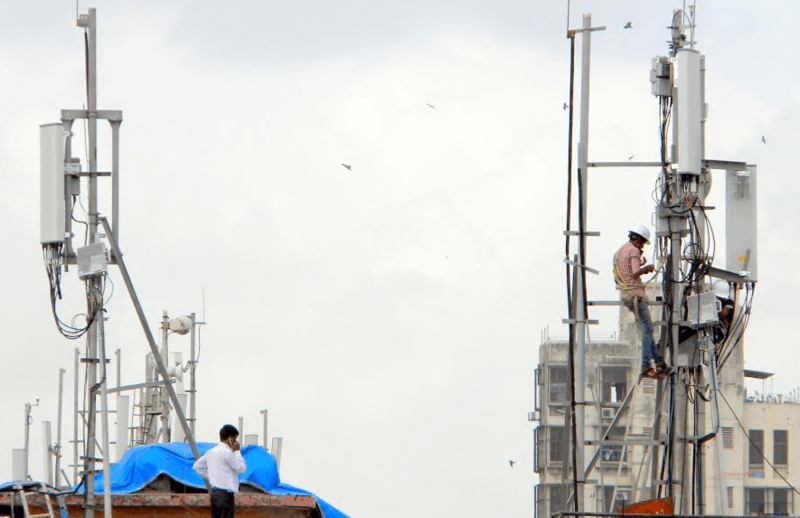 Reliance Jio has completed the upgradation of its network in the Kolkata circle with the deployment of unused 5 MHz spectrum block in the band 3, now running the network with a total of 10 MHz spectrum in the band 3, according to information shared by a tipster. The move will help the company offer better speeds to customers in the circle. The Mukesh Ambani-led telco is running 4G services using the FDD-LTE technology on the Band 3 or 1800 MHz band, besides 20 MHz spectrum block in the 2300 MHz band in the Kolkata circle, which it acquired in 2010 auctions. In last two auctions in 2014 and 2015 Jio had acquired a total of 10MHz spectrum on 1800MHz band in Kolkata. 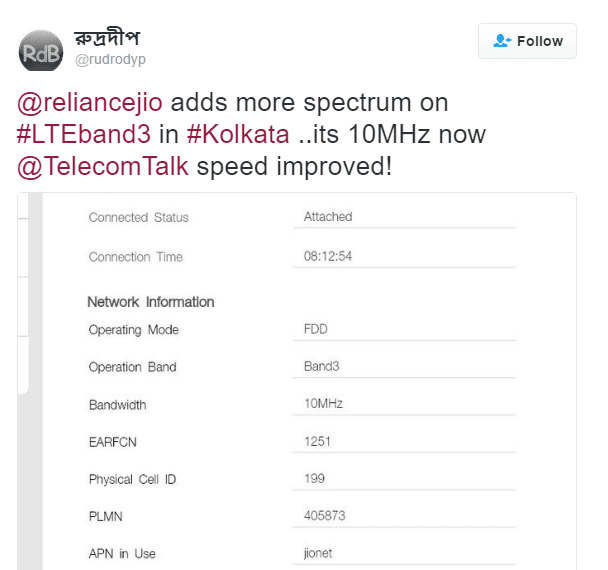 As a whole in Kolkata, Jio has now offering LTE over 20MHz x 2300MHz (another 10MHz topped up in recently concluded auction in October 2016), 10MHz x 1800MHz (band 3) and 5MHz x 850MHz (band 5, of RCom via spectrum sharing deal) to cover up outdoor and indoor extnesively. And on our experience we found Jio ensures smooth transtion between LTE-TDD on 2300MHz to LTE-FDD on 1800MHz and 850MHz. 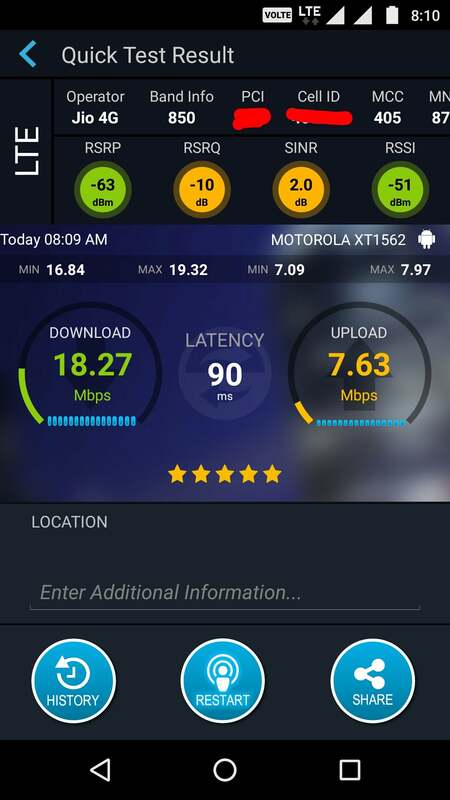 We already have seen improvement of speed in both uplink and downlink while on indoor on 1800MHz in Kolkata. And we will definitely see more bandwidth added across all bands in other circles very soon to improve present bandwidth which is already quite enough. Reliance Jio recently acquired the right to use 269.2 MHz (UL+DL) spectrum across for a total of Rs 13,672 crore, futher increasing spectrum footprints to 1,108 MHz (UL+DL) with an average life of over 16 years. In the recently concluded spectrum auctions, Jio won 850MHz spectrum 4 circles, 1800 MHz in 8 circles and 2300 MHz in 16 circles.The telco has spent Rs 3,623 crore for 15 Mhz of spectrum in the 800 MHz band, Rs 2154 crore for 39.60 Mhz spectrum in the 1800 spectrum and Rs 7895 core in the 2300 MHz band. Jio renewed its expiring spectrum in 850 MHz band in Gujarat circle and purchased additional spectrum in the 850 MHz, 1800 MHz and 2300 MHz bands at 6.5% premium to reserve price. The 4G entrant had announced commercial services on September 5 with the launch of “Welcome Offer.” Under the offer, Jio is offering 4GB data per day, along with unlimited voice and SMS services till December 31. Reliance Jio recently said that it crossed 16 million subscribers in September, its first month of operations. Jio claimed to have achieved this growth faster than any other telecom operator or start up in the world including the likes of Facebook, WhatsApp and Skype. Here at Howrah it seems like when you are not using mobile data the phone latches onto 1800 mhz and as soon as you connect mobile data it switches back to 2300 mhz. And yes 1800 has more speed indoors than 2300 and vice versa. which area and which software it is?